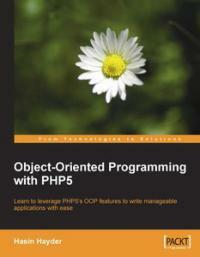 Some basic objected-oriented features were added to PHP3; with PHP5 full support for object-oriented programming was added to PHP. Object-oriented programming was basically introduced to ease the development process as well as reduce the time of development by reducing the amount of code needed. OOP can greatly improve the performance of a properly planned and designed program. This book covers all the general concepts of OOP then shows you how to make use of OOP in PHP5, with the aid of an ample number of examples. What you will learn from this book?